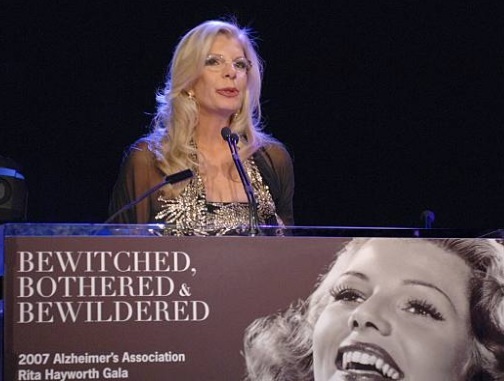 For over three decades now and every year since the mid-eighties, on the Saturday before Mother’s Day Sunday, Princess Yasmin hosts a grand gala dinner in memory of her mother – Rita Hayworth, benefiting Alzheimer’s Association. This grand gala, continues to be an enduring legacy of one daughter’s love for and commitment to her mother, a commitment that has stretched over time and place – now celebrated for more than 30 years in both Chicago and New York, raising millions of dollars for awareness and research, and benefiting millions more – victims and families across America. On Saturday, May 12th, more than 700 guests celebrated at the 31st Annual Alzheimer’s Association Chicago Rita Hayworth Gala underwritten by Rolex. Over a million dollars was raised at the grand gala at the Hilton Chicago. “ More than anything, we are grateful to Princess Yasmin Aga Khan, who is a shining example of the difference one person can make. Begun in New York in 1984 by Princess Yasmin Aga Khan in honor of her mother Rita Hayworth, the gala recognizes individuals who have a personal connection to the disease and use their national platform to raise awareness and provide support for the more than 5 million Americans and the estimated 16 million who are serving as caregivers impacted by the disease. Under her leadership, over $74 million has been raised through the Chicago and New York Rita Hayworth galas. All funds raised through the galas support the Alzheimer’s Association’s research, care, and support programs. What more can a loving daughter do in memory of her mother. Congratulations to all the donors and more so to the volunteers who spend hundreds of hours with patients who have this disease. Today, many volunteers give their time for good causes and donors who give for this great cause.